Years ago, when I was a newbie food blogger, the use of chocolate was pretty simple. There were chocolate chips, baking chocolate, chocolate bars and unsweetened cocoa powder. And then I discovered cacao powder. And mispronounced "cacao" for about eight years. You say "Ka-Cow" I say "Ka-KAY-Oh." Whatever. It was a new concept to me to switch around a few letters and boom, have a whole new product, yet the same source ingredient: the magical cacao bean. Ka-KAY-oh bean. Ka-Cow? I still say it wrong guys. After cacao powder, came cacao nibs and cacao butter. And chocolate percentages became mainstream culinary chatter. Percentage snobs, like my dark chocolate-obsessed husband, popped up. "Anything under 70% cacao isn't worth it." And things got even more interesting - and more complicated. "I mean, it's all chocolate, right?" Yes. But that is also like saying diamonds and rubies and sand and quartz are all just minerals. True, but also not the full story. So let's chat about the full story of chocolate. 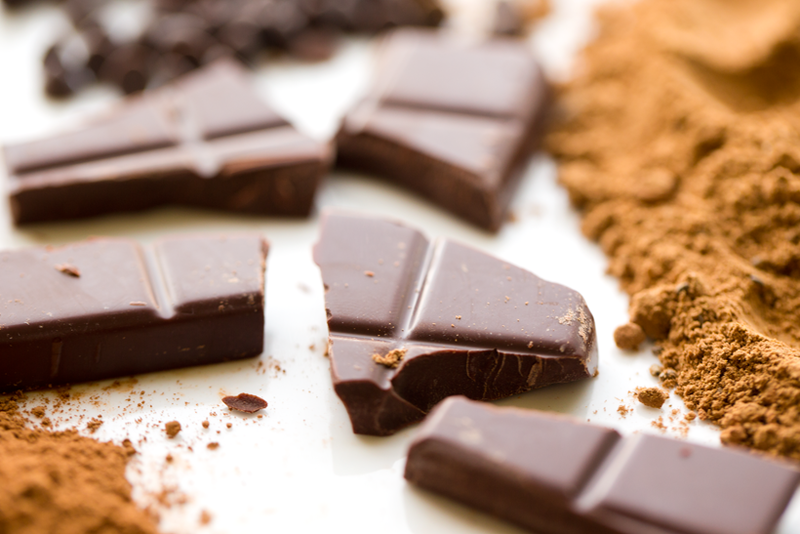 All about cacao, cocoa and more..
First off: What is the difference between cocoa and cacao? This is the most asked question I get about these two ingredients. They look pretty much the same, both brown chocolate-y powders. They both come from the same source, the cacao bean. But the difference is in the processing. The short answer is that cocoa powder is processed using traditional roasting and high heat methods, while cacao takes a gentler approach, using cold-pressing methods and less heat when possible. Is Cacao raw? I don't want to say a sure yes to this. I feel like I should use Ross Geller air quotes and say, "raw" because from my research the temperatures used to processed "raw" cacao products are not set in stone, aka strictly regulated by anyone other than the company producing them -- and so variations may occur among brands etc. So "raw" for this post basically means, less processing and less heat than traditionally processed cacao beans. This gentle processing is said to keep the enzymes and molecular structure more in tact - preserving a higher antioxidant capacity. Side Note: Interestingly enough, all cacao products need to be fermented in some way simply to help develop the tannins and flavor of the end product. From what I have read, unfermented beans are pretty inedible. I guess this is comparable to wine. You can crush all the wine grapes you want, but without the fermentation process, you are just drinking grape juice. Another big question: Is there a big difference when it comes to health benefits of "raw" cacao versus cocoa products? I mean, aren't there antioxidants in both processing methods? Truthfully, since I am not a food scientist in a lab, I don't have a first hand answer. But from my years of reading about this topic, and today's online research, my view is that when it comes to cacao vs cocoa nutrient benefits and most foods really, the less processing from when it was harvested, the more nutrients and enzymes will still be in tact. So back to the mainstream claim of chocolate being healthy..
And even saying "dark chocolate is good for you" can get tricky because even a richer percentage of cacao can be laced with loads of refined sugar and dairy and other goodies like toffee, caramel and marshmallow and are you hungry for a candy bar yet because if so I apologize, type goodies. But let's not completely nit-pick chocolate, please? I say, everything in moderation. If you want to indulge in lower 'quality' chocolate bars because they taste good - go for it! But if you are truly looking to increase the health benefits in your servings of chocolate products, don't shortchange yourself by skimping on quality. Go for the good stuff! And by good, I mean the minimally processed, less "other stuff" added products. The cacao butter, cacao powder, cacao nibs, high quality cocoa powder and high percentage dark chocolate bars, mostly. Now I'd like to go through the list of different chocolate products one by one..
1 - Cacao Nibs: Cacao nibs are tiny, knobby bits that look almost like smashed and crumbled corn flakes, though they are dark brown and hard in texture. They also look a lot like smashed coffee beans. 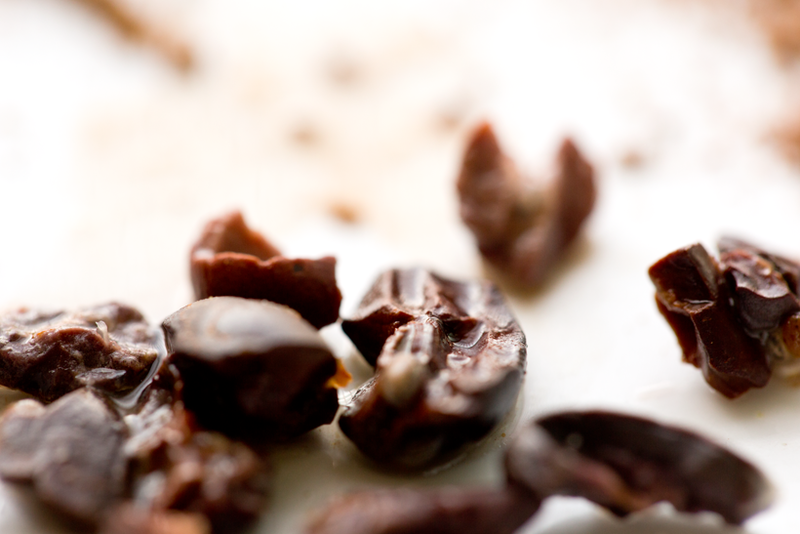 Cacao nibs are crumbled from whole cacao beans and are extremely rich in antioxidants. They are also rich in fiber, iron and magnesium. Their flavor is rich and bitter and might remind you of a very dark chocolate bar. They are tricky to chew, so make sure you have good teeth before chomping away. Uses: My favorite use for cacao nibs is to add them to smoothies. They blend up well like chocolate chips and the blending process makes them easier to consume for me. I find the super bitter taste and hard texture a bit too strong to consume just on their own. However, my husband who loves super rich chocolate likes to nibble them on their own. Buy cacao nibs on Amazon. 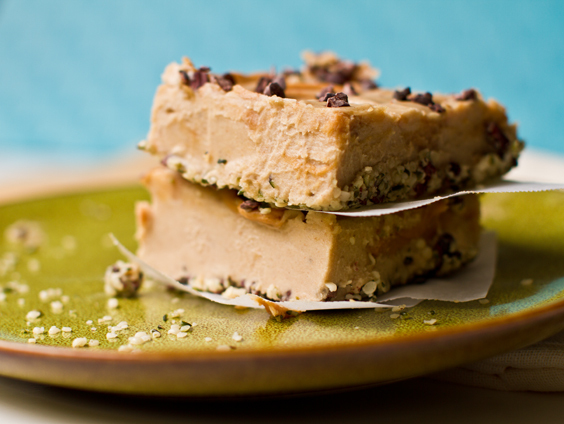 Peanut Butter Fudge Bars with cacao nibs on top..
2 - Cacao Butter: Cacao butter is the cold-pressed, pure, white-ish oil from the cacao bean. Cacao butter is used when making chocolate bars and chips. It contains omega-6 and omega-9 fatty acids, antioxidants, oleic acid and theobromine. Cacao butter looks like white chocolate and tastes a bit blander than the nibs, though it still has a chocolate flavor. Cacao butter is mother nature's version of white chocolate. The word "oil" to describe it is actually very misleading because cocao butter is firm at room temperature, really looking like white chocolate. Though is melts to an oil at body temperature. Apparently you can use it as a body oil! 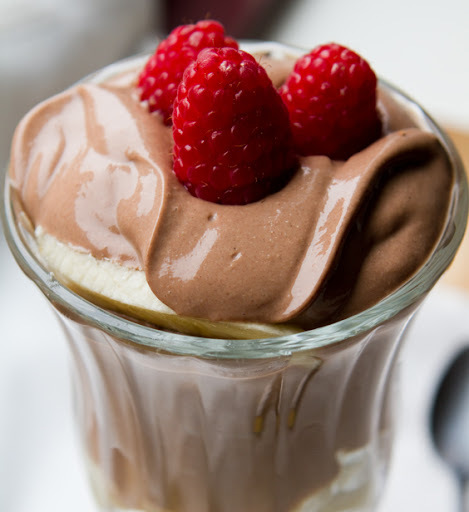 Uses: My favorite use for cacao butter is adding it to chocolate smoothies. 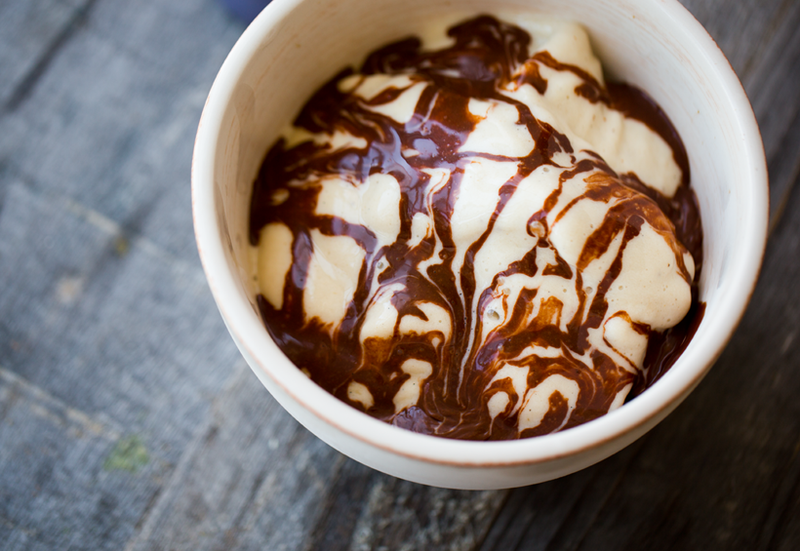 It adds an ice cream like texture from the rich fats. I also love to nibble bits of cacao butter or use it to make homemade chocolates or even for baked goods. 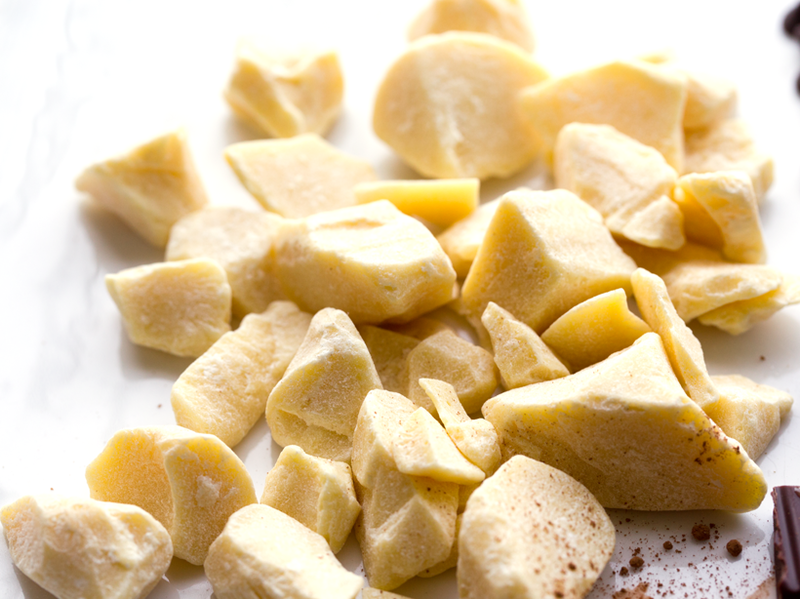 It is so fun to make vegan white chocolate using cacao butter. Buy cacao butter on Amazon. 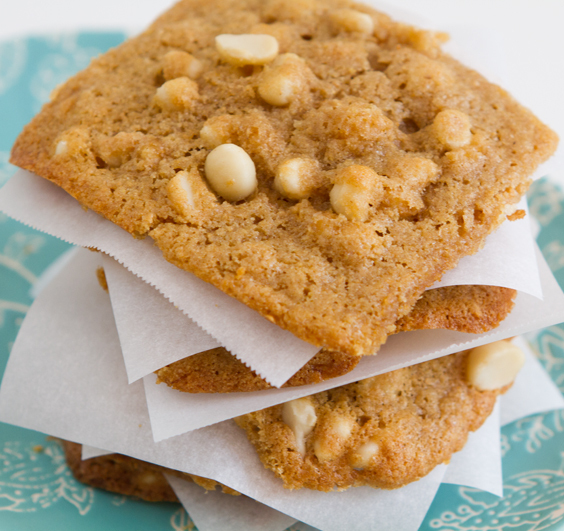 These white chocolate macadamia cookies would be perfect with homemade cacao butter chocolate chunks. 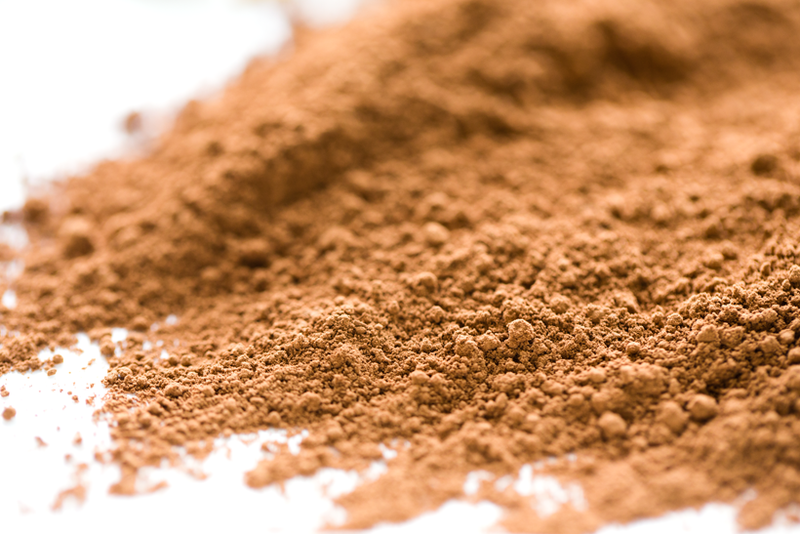 3 - Cacao Powder: Cacao Powder looks very similar to cocoa powder, but the processing is different in that it uses less heat, focusing on cold-pressing methods. I don't want to go too deeply into the processing of cacao powder because I have found that different sources have different methods. But overall, the beans are separated into nibs and the cacao butter (fat removed) and then the nibs are processed as low-heat as possible to create the cacao powder. Uses: This is my favorite "chocolate" product by far. I find the flavor is so smooth and lovely and it blends super easily with a wide variety of recipes for pudding and smoothies and baked goods. I guess the funny part is that if you are using "raw cacao powder" in baking recipes, you are heating it, but I am guessing that the heat from your oven is much less intense than the heat from a processing plant for cocoa powder. Just my guess. Buy Cacao Powder on Amazon. 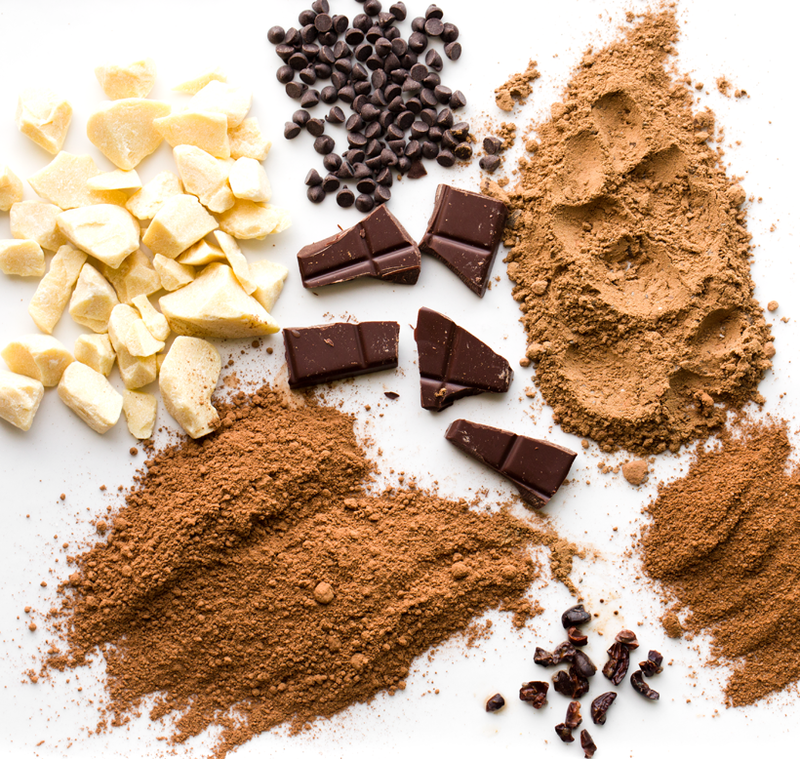 4 - Cocoa Powder: Cocoa Powder is very similar to cacao powder since it comes from the same source, but the processing is different since cocoa powder allows for the bean nibs to be roasted. 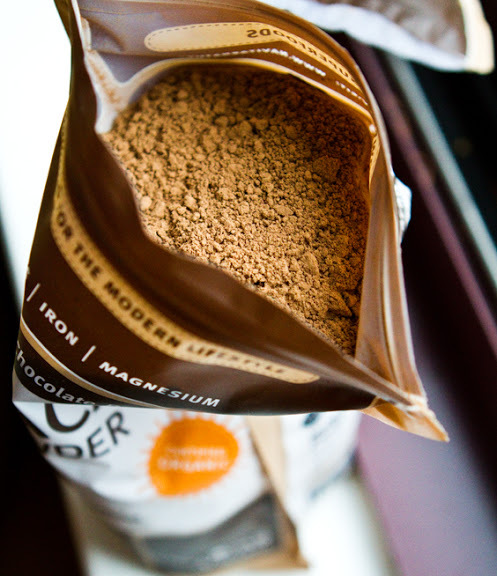 Cocoa powder is unsweetened - just like cacao powder. From Serious Eats: "Cocoa powder is the dry solid remains of fermented, dried, and roasted cacao beans. The beans are cracked into nibs, which are then ground into a paste made of cocoa solids suspended in near-flavorless cocoa butter. Once processors extract the butter they're left with the crumbly solids, which are then ground into a fine powder." 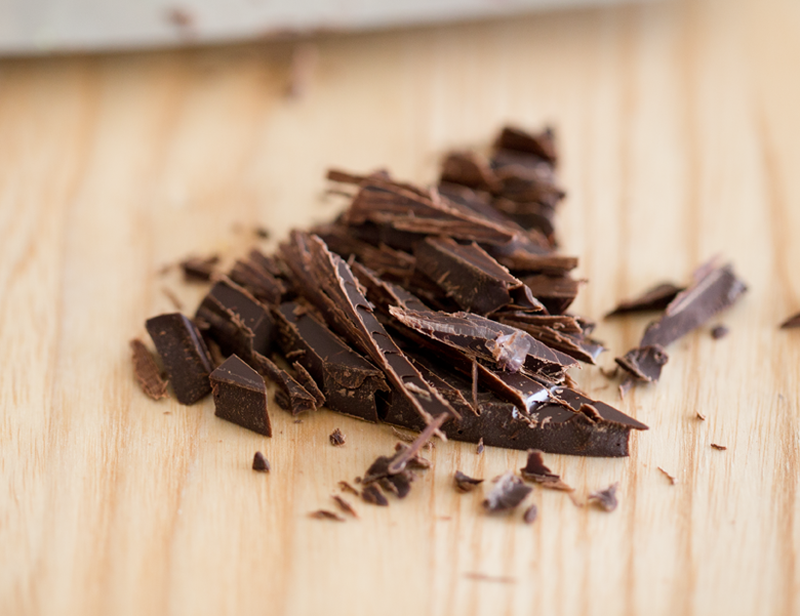 Generally speaking, Dutch-processing adds an additional step to alkalize the cocoa. The end product for Dutch is less bitter and more neutral in acidity - more alkaline. Natural (non-Dutch) cocoa powder is more acidic. And can actually activate ingredients like baking soda in a recipe - which is so neat to me. Yay science! So using Dutch processed cocoa (alkaline) could possibly leave you with flat brownies or cakes if used inappropriately. I found this article from Serious Eats to be really helpful. And the line about cocoa wearing little wooden shoes creates an adorable visual. The article also says this, which is actually pretty confusing, but I trust that Serious Eats knows their baking factoids, so.. "If a cake or cookie recipe only calls for baking soda, it likely uses acidic natural cocoa. If it only uses baking powder, it'll probably ask for Dutch process cocoa instead..."
To be completely honest, the whole world of Dutch vs Natural cocoa thing seems pretty intense and varied and even a little confusing still, simply because there are SO MANY cocoa companies producing powder, all with their own processing methods and favors. If you want to dive deeper into that world, check out posts like this from King Arthur Flour. Dutch Cocoa = less bitter, more alkaline. Natural Cocoa = more bitter, acid. "Can I use raw cacao powder in a recipe that calls for Natural or Dutch-processed cocoa??" Yes, in general. 1:1, the ratio will be the same. But be aware that you might need to tweak a few ingredients and also that the flavor will vary. From my understanding, "raw" cacao powders are more acid in nature since they are not processed to be alkaline, so they would more mimic a 'natural' cocoa powder. I actually couldn't find any products for Dutch-processed cacao powder.. Uses: Cocoa powder can be used to make brownies, cakes, puddings, smoothies and more. Buy Cocoa Powder on Amazon. 5 - Chocolate: Chocolate refers to a smooth substance that has been created by combining several components of the cacao bean. Most chocolate bars contain cacao butter and chocolate liquor. Chocolate liquor is another confusing term because if you are like me, you are picturing a shot glass filled with some distilled beverage containing a chocolate-y aroma. Nope. Chocolate liquor is actually more like super rich melted chocolate, it contains both cacao bean solids and butter. Most chocolate bars contain cocoa butter, cacao liquor, a sweetener and sometimes some other fillers or binders or flavorings. Uses: Chocolate is obviously the most user-friendly form of cacao beans in that it is usually sweetened a bit and has an extremely smooth and cravable texture. Chocolate can be eaten alone or used in cookies or melted down for recipes. 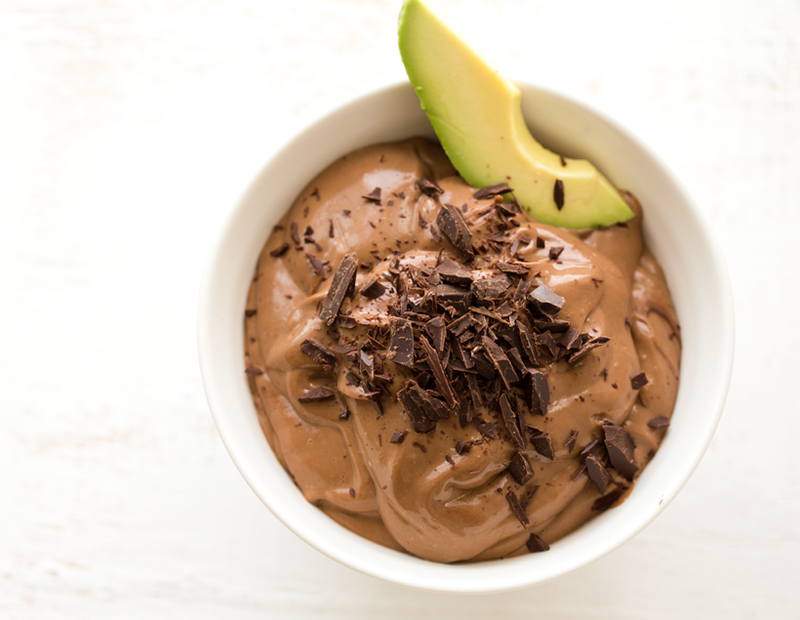 Chocolate pudding using avocados and melted chocolate chips..
6 - Carob: Carob feels like an imposter in this conversation because it comes from a completely different plant source, the Carob Tree. It does contain pods and beans - so that is pretty similar. But carob has a very different flavor. It is sweeter and perhaps a bit less complex than chocolate. Carob is popular with people who are avoiding caffeine because it doesn't contain the mild stimulant found in cacao, theobromine. 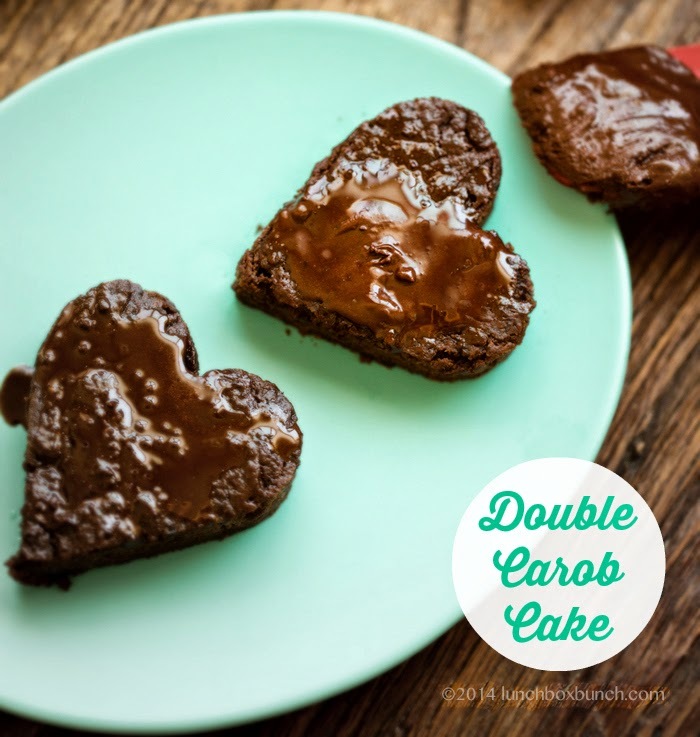 However, carob also does not contain those famous chocolate antioxidants -- though I would suspect carob has a few antioxidants of its own, just less researched for obvious reasons .. mainly that carob really doesn't taste as dreamy as chocolate. But honestly, I love carob. I would use it more on my blog if people loved it as much as me. I did do a pretty swanky carob cake a few years ago. Uses: Carob can be used in any way that cocoa can, but keep in mind that carob has a much sweeter, less bitter flavor than "chocolate." Buy Carob Powder on Amazon. 7 - Cacao Blends And finally we make our way to chocolate blends! There are a few to look out for. 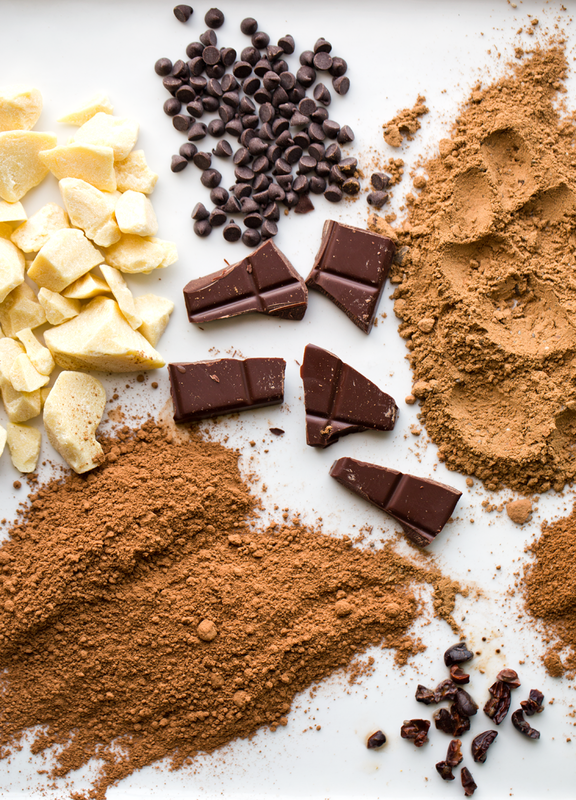 The most popular being cocoa powders to make hot chocolate. Most of these contain Dutch-processed cocoa (less bitter version) and some sort of sweetener and maybe spices. Sometimes milk solids are added as well, so be sure to read those labels if you are vegan. Uses: Blends are usually used in beverages, but may also be used in some baking projects as well. Buy Cacao Magic by Philosophie. Ok that's it! I think we worked our way through the Cacao Bean world, yes? If you have any questions or additions to anything I have chatted about here today, please leave them in the comments! Happy chocolate eating!! Info Disclaimer: I am not a chocolate expert guys, this info is simply all the stuff I have learned from reading books and online resources and from brands themselves. I wish I could have my own food science lab or travel directly to the cacao farms to see the processing in action, but for now I'm just a very curious, chocolate-loving food blogger. If you want to add anything to this post or feel like correcting anything I have said, please do in the comments! Food is an ever-evolving conversation. And I'm figuring it all out just like you.